Two for the Price of One University Collections of Art and History recently purchased prints by iconic American artists Thomas Hart Benton and James Abbott McNeill Whistler, and they are already being incorporated into courses in art and art history. Outside the art history classroom in Wilson Hall, University Collections of Art and History (UCAH) and the Art and Art History Department have created an informal study gallery that features paintings and prints from the university’s art collection. 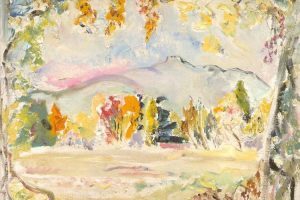 During Winter Term, the works on exhibit are supporting classes that include Survey of Western Art and American Art to 1945. Recently, two newly acquired prints joined the display: “Billingsgate,” an etching by the notable 19th-century artist James Abbott McNeill Whistler (1834-1903), and “The Fence Mender,” a lithograph by the iconic 20th-century artist Thomas Hart Benton (1889-1975). This past summer, I had the opportunity to bid at auction for these prints. Initially, I was interested in Benton’s lithograph, which I saw illustrated in an auction catalog. A noted leader of the American Regionalist movement, Benton was not represented in our collection. After talking with art faculty to gauge their interest in the print, and then researching market prices, I made a recommendation to our collections committee that we attempt to acquire the lithograph and make a bid not to exceed a particular amount. Later, I learned that an etching by Whistler would be in the same auction. A significant artist, he was not represented in the collection, either. After additional research and some creative thinking, I suggested that if the Benton lithograph sold for less than the amount already approved by the committee, I might also bid on the Whistler, not to exceed the original approved total maximum. The committee said yes, our bids were successful, and ultimately we were able to purchase “two prints for the price of one.” Such are the opportunities that auctions sometimes offer. Thomas Hart Benton’s popularity and influence was at its peak in 1940, when the Associate American Artists published “The Fence Mender” in an edition of 250 prints. A lithograph is a type of print in which an image is drawn on a specially prepared lithographic limestone with grease pencils or crayons. The stone is then treated with a chemical etch, inked and run through a press under a damp paper. The resulting image is a mirror of the original drawing. 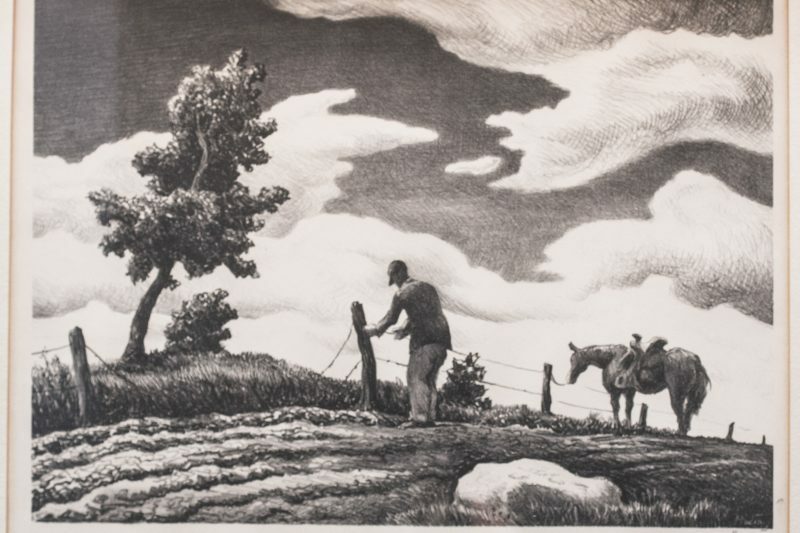 “The Fence Mender” by Thomas Hart Benton, lithograph, published by the Associate American Artists, 1940. The Associate American Artists was a publishing company formed in 1934 to market affordable art to the masses. It focused on lithographs by regionalist artists like Benton. 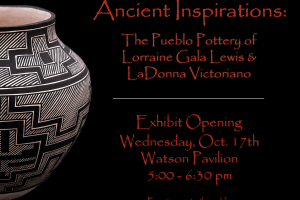 The prints sold for $5 each, initially available in department stores across the country and later through mail orders. A native of Missouri, Benton was known especially for his murals that depicted the American heartland. He studied at the Art Institute of Chicago and the Académie Julian in Paris, where he met the Mexican muralist Diego Rivera. He also became acquainted with the abstraction of the Synchromism art movement, which stressed the musical qualities of color. These two influences and his work during WWI as a Navy architectural draftsman contributed significantly to his distinctive and recognizable style of realism. After the war, Benton returned to New York City and later taught at the Art Students League, where Jackson Pollock was one of his students. He produced a series of murals for the New School for Social Research entitled “America Today,” now in the collection of the Metropolitan Museum of Art, which launched him as one of the leaders of the Regionalist movement, along with Grant Wood and John Steuart Curry. During the 1930s, Benton completed a number of mural commissions for the Whitney Museum of American Art in New York and the Century of Progress Exposition in Chicago. He used his murals to protest the KKK, lynching and fascism during the 1930s and 40s. Extremely popular during this time, Benton and Regionalism were overshadowed just a few years later by the Abstract Expressionism that surged after World War II. American born James Abbott McNeill Whistler became a leading proponent of Aestheticism, or “art for art’s sake,” and was a predecessor of modernist abstraction. He may be best known for his widely reproduced 1871 seated portrait entitled “Arrangement in Grey and Black No. 1: Portrait of the Artist’s Mother.” Like Benton, Whistler was interested in the relationship between music and color, and often titled his works “nocturne,” “symphony” and “arrangement” in reference to his exploration of tonal harmonies. His fascination with Japanese art and woodblock prints is reflected in the compositions and spatial organizations of his paintings and prints, and in his famous decorative “Peacock Room” that is now located in the Freer Gallery in Washington, D.C.
Whistler, a skilled draftsman and a meticulous craftsman, was also a noted printmaker who was on the forefront of a renaissance of the art of etching in Britain during the late 19th century. An etching is a type of intaglio print that is drawn on a copper plate prepared with an acid-resistant ground that is scraped away with etching needles, exposing lines that are later eaten away in an acid bath. The plate is inked, wiped and run through a press under a dampened piece of paper. The result is a reverse image that might stand as initially pulled, or the plate can be worked and reworked in several states until the artist determines that it is finished. Whistler experimented extensively with the process, inks, tone and papers, and created almost 500 prints during his lifetime. 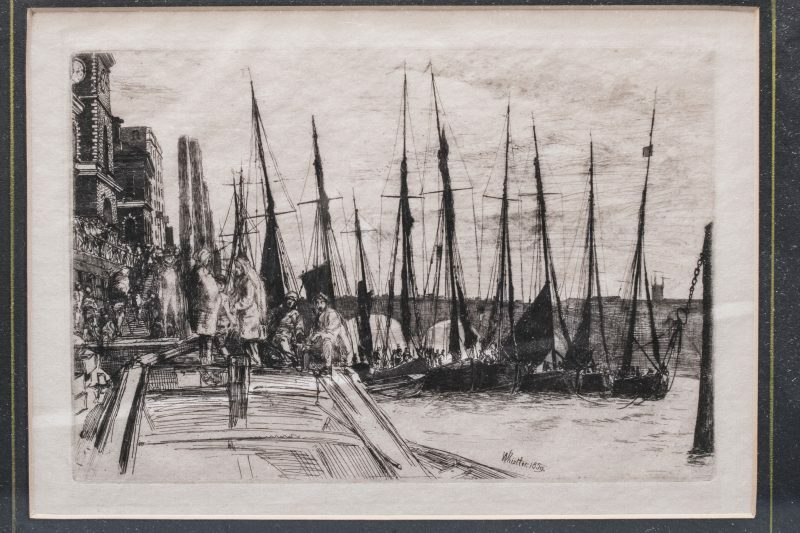 In 1859, early in his career, Whistler moved to London, where the hubbub of the docks and the effects of encroaching modernity on the Thames River fascinated him. He began a series of etchings depicting the region, and “Billingsgate” was among the earliest. In it, workers stand along a landing with a line of fishing boats to the right. The horizontal and vertical elements of the composition, along with the cropped, frontal placement in the immediate foreground of a barge with boatmen, exhibit influence from Japanese prints. “Billingsgate” by J. A. M. Whistler, etching with drypoint, probably published by P. G. Hamerton for the third edition of his Etching and Etchers, 1880. Whistler often added drypoint to heighten or enhance his images, and he learned to exploit mistakes, manipulate ink in the process of wiping the plate, and use different papers in order to create variations from print to print. His etchings, of which “Billingsgate” is among the earliest, became increasingly lyrical and evocative over time, much like his paintings. The Benton lithograph and the Whistler etching are now part of the university’s art collection, which serves as an academic resource that crosses disciplines. Students can learn directly from these prints and other artwork, gaining a sense of scale that neither textbooks nor digital images provide. In Wilson Hall, as in other academic buildings, the students are invited to examine the works up close and revisit them throughout the term, absorbing details and making new discoveries along the way.